On Monday mornings my wife and I head to the main branch of the Redwood City public library to do a little volunteer work for Friends of the Redwood City Public Library, an all-volunteer organization that, through the sale of donated books and member donations, funds a number of Library-related programs. We try to get our work done by noon, after which we usually stroll over to Broadway for lunch at one of our local eateries. Our normal route takes us across Middlefield Road, through the small plaza between City Hall and Donato Enoteca, and through the City Hall/Main Street parking lot, emerging on Broadway via the driveway between Arthur Murray Dance Studio and Rockn Wraps. We take that route because it is the most direct between the library and the section of Broadway with the most restaurants. It means walking through an active parking lot, but there usually isn’t too much traffic and there are some sidewalk sections, so as long as we remain alert we have little trouble. But as we walk through I cannot help but think about what our walk would be like if, instead of it being a parking lot, that large space was instead a large municipal park. A little over a year ago I proposed turning the lot into just that (in my post Some Assembly Required), and at about the same time a consultancy firm began to review a half-dozen city-owned parcels to determine which, if any, might be suitable for a downtown park. The consultant, SERA Architects, recently completed Phase I of their study and presented the results to a number of organizations, including the Parks, Recreation and Community Services Commission, the Planning Commission, the Complete Streets Advisory Committee, and, most recently, the City Council. I watched their presentation to the combined Planning Commission and Complete Streets Advisory Committee, and the somewhat shorter presentation they gave to the City Council. I also read the “DRAFT Downtown Parks Site Assessment and Feasibility Study,” upon which the oral presentations were based. I’ll go over some of the results here, but if you want to learn more you should read the study and watch the presentation to the City Council (the audio recording didn’t work very well during the presentation to the Planning Commission, making it hard to hear what is being said at times). SERA Architects studied six city-owned downtown properties. This small 46-space parking lot sits next to the old “Pizza and Pipes” restaurant, on Winslow Street near the Caltrain station. Recently it was used to stage construction equipment and materials for the 815 Hamilton project (the nearly complete building being constructed behind the Fox Theater). While there were some things to recommend this as a park site, it isn’t very large (just 1.1 acres) and the noise produced by Caltrain make this site less than ideal. Instead, the consultant strongly recommended that the City consider an alternate use for this site, such as for low-income housing. The consultant looked at all three library parking lots (Lot A, at the corner of Middlefield and Main, Lot B, at the corner of Middlefield and Jefferson, and Lot C, behind the library building) and zeroed in on the 51-space Lot A, plus the adjacent Roselli Park (shown below). Although its location at the corner of two busy streets (Middlefield and Main) dampen the site’s appeal somewhat, its proximity to the library recommends it, particularly as a place for a park aimed at young children. Roselli Park, when combined with Parking Lot A, would make for a 1.7 acre park that could be used for both library and city functions. 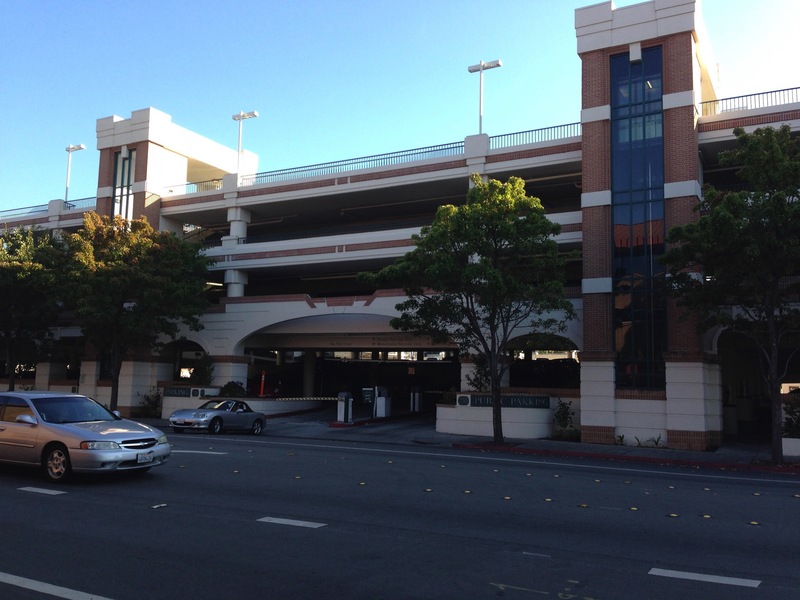 This site includes the small 15-space parking lot behind City Hall and the large 150-space Main Street parking lot that occupies the center of the block. The consultant noted that a park here wouldn’t necessarily have to consume the entire area, and indeed at least some of the available space would have to be configured so that services (such as trash pickup) could continue to be provided to the surrounding buildings. At 3.3 acres this site is the largest of those studied, and could easily be organized into multiple distinct spaces. It has the benefit of being relatively protected and quiet, thanks to the surrounding buildings. The consultant expressed some concern that there may not be enough “eyes” on the space for security purposes, but I wonder: between the housing that overlooks the space, City Hall itself, and the four-story building being constructed at 2075 Broadway, there are a lot of windows looking over the site. Some of the businesses around the edge (Rockn’ Wraps and Pasha Mediterranean, in particular) could easily be modified to have seating along the park side. And finally, the paths that would presumably crisscross this park would likely draw lots of people. Thus, safety may not be any more of an issue here than at any of the other sites. This one is a great example of out-of-the-box thinking. The consultant did not recommend that the city pursue it as a park site, but did note that the city might want to use it from time-to-time for public events. The logistics and the expense of turning the top deck of this garage into a park caused it to be eliminated from the final list, but I have to think that a park up there wouldn’t have gotten much use anyway. Below is an old picture I have of the small triangular park bounded by Spring, Marshall, and Walnut streets. The existing “parklet” is very small, but if the city were to abandon the adjacent one-block section of Spring Street and add it to the park, the space grows to 1/2-acre in size. That’s still somewhat small, though, and combined with the fact that it is on the edge of downtown, this site was dismissed. This option doesn’t consist of a large neatly shaped parcel upon which the city could put, say, a play structure. 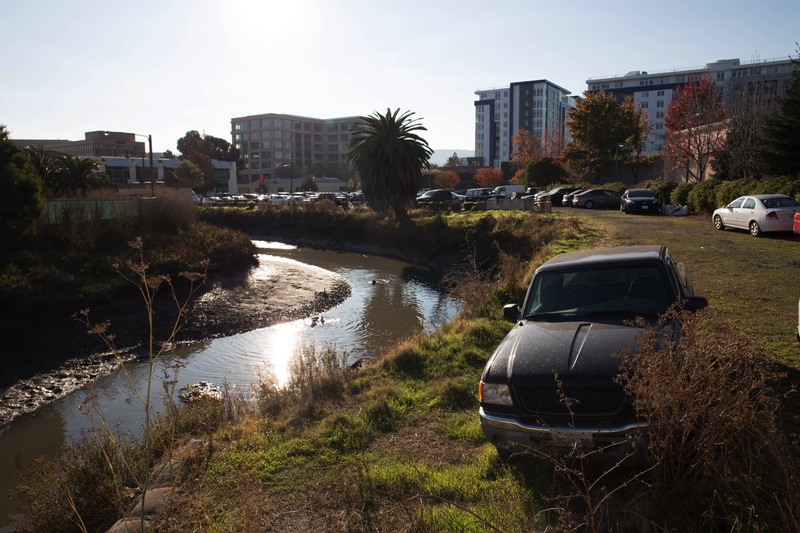 Instead, this site consists of the narrow city-owned strips of land on either side of Redwood Creek between Bradford Street and Convention Way (which is essentially where the creek ducks under Highway 101). The consultant nixed this site as suitable for a downtown park, but in the same breath noted that they felt it should be developed independently as a creek-side pathway for pedestrians and cyclists. This path would connect up with the soon-to-be-constructed Highway 101 underpass, allowing us to walk from Bradford Street all the way to where Redwood Creek empties into the bay. Everyone seemed to really like this idea, so expect it to see further discussion around a Redwood Creek pathway regardless of what happens with a downtown park. 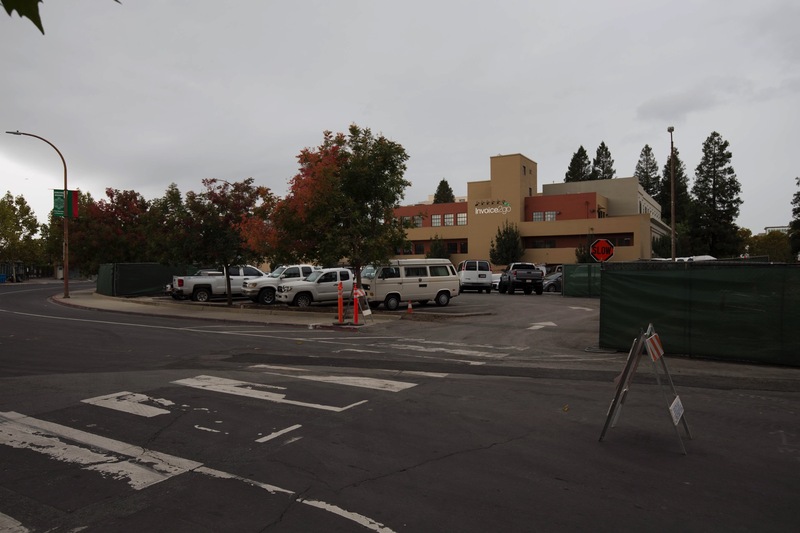 Two sites—the Library Lot A/Roselli Park site and the City Hall/Main Street parking lot site—will move on to Phase II, where the consultants will do some preliminary site planning and determine what it would take to turn each site into a park. Part of this will involve determining just what kind of park will be most appropriate for each site: so far each was looked at based on how suitable it was for some sort of park, rather than based on how well a park there could serve a particular set of needs. From Phase II we will learn just how a park on the two chosen sites would impact the city, what each might cost, and how they would most likely be used by downtown residents and visitors. On the subject of impacts, I want to address two: the loss of parking, and the cost to construct a new park. Because the two chosen sites are both partly or entirely parking lots, developing either would necessitate a loss of existing parking spaces. But given the number of parking spaces that are available and are coming online in some of the new and under-construction commercial buildings (spaces which are available to the public in the evenings and on weekends), we might not need to replace them all. And if they do need to be replaced, there is always the option to build additional public parking downtown, likely in the form of a new parking garage. Thus, a downtown park does not necessarily mean a net loss of downtown parking. That brings us to the other big issue, which is money. 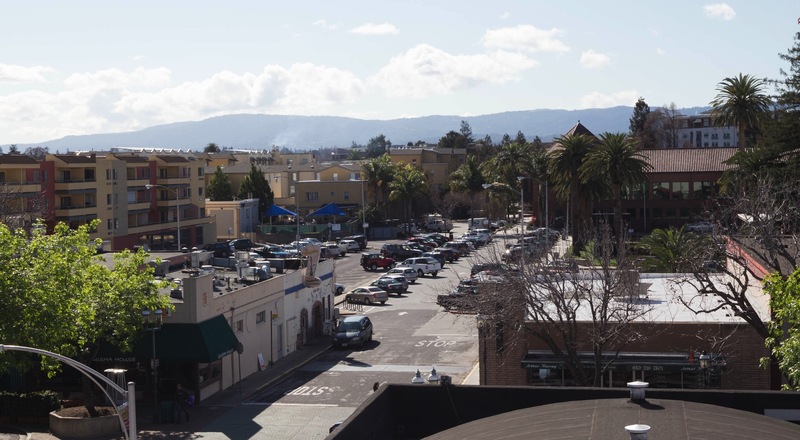 Redwood City is projecting a drop in sales tax revenues, and is already having discussions about the best way to cut operating costs. Given that, some ask, should we really be spending money on a new park? As it turns out, a new park wouldn’t be built using General Fund monies. Instead, it would be constructed from Redwood City’s dedicated Parks Fund. This fund gets its monies from impact fees paid by the developers of those residential projects you see going up in Redwood City. The fees work out to about $10,000 to $11,000 per residential unit, meaning that, for example, the 125-unit apartment project recently approved for 353 Main Street could pay roughly $1.25 million into this fund alone. Parks Fund monies can only be used for capital improvement projects related to Parks and Rec facilities: they cannot be used, for instance, to fund a police officer’s position. Although there are other projects that will likely draw upon the Parks Fund—such as the revamp of the Veterans Memorial Senior Center—our Parks, Recreation & Community Services Director has already set aside about one million of the fund’s dollars for a downtown park, and plans to set aside an equal amount next year for this same purpose. Oh, and if we need to build additional parking? The city has another multi-million dollar fund—also paid into by developers—for just that purpose. Phase II begins now and should run through the end of May. The consultants have heard from the City and from downtown merchants, but have yet to really hear from the majority of us who live and work here. During Phase II the city will be asking us just what would draw us to a downtown park and how we might use one. Be on the lookout for city outreach on this topic, and make your opinions heard! Whether you support a downtown park or not, and whether you would actually use it or not, your thoughts on this matter are valuable and should be made known to the folks working on this project. Personally, I hope that a park gets built, and that it occupies as much of the Main Street parking lot as possible. 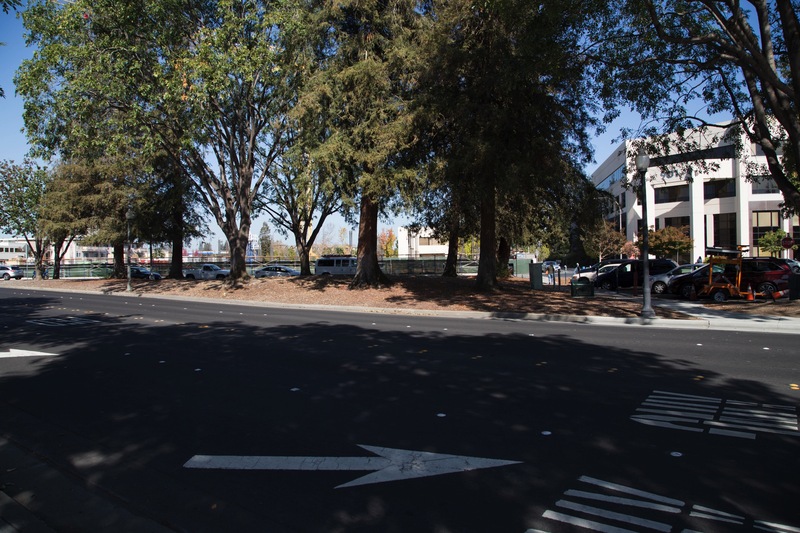 I’d love to be able to make that walk from the library to Broadway along a meandering path through native plantings, rather than through a concrete-and-asphalt lot that is mostly filled with parked cars. I think the Winslow site (#1) should be retained for a plaza. It is at the end of Hamilton Street, which itself could/should be pedestrianized and made into a linear park through the downtown, through the County Government Center, stretching up to Veterans Blvd., at which point it could connect to a walking/bike trail north of Veteran’s, going under 101 and connecting to Bair Island, Redwood Shores, etc. There are plenty of sites for housing downtown but very few potential park/plaza sites. I am also hoping the Chase bank property could be used as a park! Also really love the idea of day-lighting (revealing) the creek between Jefferson and Main, starting with the parking lot behind City Hall (site #3). This is very doable: see San Luis Obispo, Ca’s creek-side park as a similar example. Eventually, that fire station and parking garage may be gone, as well, allowing for more creek. I learned something here. I didn’t realize the main street parking lot was not only for the public but also for residents in the adjoining apartment complex. This deepens my belief that a larger garage should be built on this lot. Put a 3-4 level garage on this main st lot, just like the marshall st garage, and put a park on top of this new garage. It would be easily accessible by the apartment residents too. Also, reserve more parking spaces for them. You have a win-win situation for the public and the residents. The creek would stay buried underneath this garage, just like at the fire station and marshall st garage. That’s what I would propose. @Samuel, @terrysagirl did not say that the Main St. lot was “for residents” … only that people who live downtown – particularly ones without their own reserved parking – also use public parking. It’s my understanding that the two long-existing Main St. apartment complexes (City Center Plaza and Redwood Plaza Village for “ambulatory and self-sufficient” seniors 55 and over), both low-income (subsidized) housing, were permitted to be built with limited parking owing to their highly-walkable locations and to keep costs down (e.g. 1BR for ~$900; 2BR for ~$1,300). I understand adding a park to the Marshall St garage would be cost prohibitive but what about building a new multi-level garage with the plan including a top level park? I could see that as a real possibility as the advance information about such a creative idea would have the public waiting for it as they are the new accessible park at Red Morton Park. That’s a good idea! If a garage/park combo was actually built as such, I’m sure it could be designed to make the park level a lot easier to access than the top of the Marshall garage. I’m sure such a thing would be cheaper than the combined cost of a new, separate garage plus the retrofit of the top level of the Marshall garage. Any preference for where you would put such a thing? Fine research. I favor the Winslow spot because it would be a gateway to downtown and a place for Caltrain users to wait for the train. Some say the train noise would be distracting but that would also be true at the library park. I doubt, however, that Winslow has a shot. Too much going for it as a housiing site. @Jim makes a good point. I also thought the Winslow site would make a great and welcoming gateway to our city in sight of the tens of thousands who pass by daily aboard Caltrain. Caltrain electrification is now underway, and the new electric trains will be virtually silent when stopped and far quieter when moving in and out of the station. Combined with legally-permitted “quiet zones” which restrict horn-blowing to an “as-needed” basis, train noise could easily be greatly diminished in the near future. I would love it (as would the folks in 201 Marshall, I’m sure) if we could reduce or eliminate the horn blowing. While I understand the need (and see countless people crossing against the crossing gates at Broadway! ), for those of us who actually respect the trains and the gates, those horns are really annoying when you are standing at the crossing waiting for the gates to rise. See my response to Jim, though–if the station gets moved, a Winslow park really wouldn’t make as much sense. @Greg, as Atherton did in 2016, the city can implement a quiet zone any time it likes. It’s a mystery to me why more Peninsula cities, and especially RWC, hasn’t done so. My guess is that the city and its interested residents and businesses are simply unaware there is a quiet zone establishment process for interested jurisdictions (e.g. cities) who wish to have one to follow. Palo Alto’s Rail Committee had a nice summary staff report regarding quiet zones last year. Please note that quiet zones still allow for horn blowing anytime the engineer believes someone (a pedestrian, bicyclist, skater, motorist, etc.) could be in danger. So quiet zones really just eliminate the mindless and needless mandatory “safety theater” train horn blowing which other countries (with lots more train service than North America has) wouldn’t (and don’t!) stand for. Also note that because people not used to hearing lots of train horns were upset at the prospect of the new additional noise, quiet zones have been very successfully established by cities and counties along the entire newly-opened 42-mile SMART train service from downtown San Rafael (soon to be Larkspur) to northern Santa Rosa. As they do everywhere else in the US, these are working quite well without any reports of increased or noteworthy rates of collisions, injuries or deaths. The bit about the RWC train station possibly moving north came up in connection with Dumbarton Rail Corridor Study released by SamTrans last year. At present, there are no plans to move the station, but it’s a possible way to get more space for one or more additional tracks and platforms for future Dumbarton rail and/or a RWC Broadway streetcar to have platforms side-by-side with Caltrain. 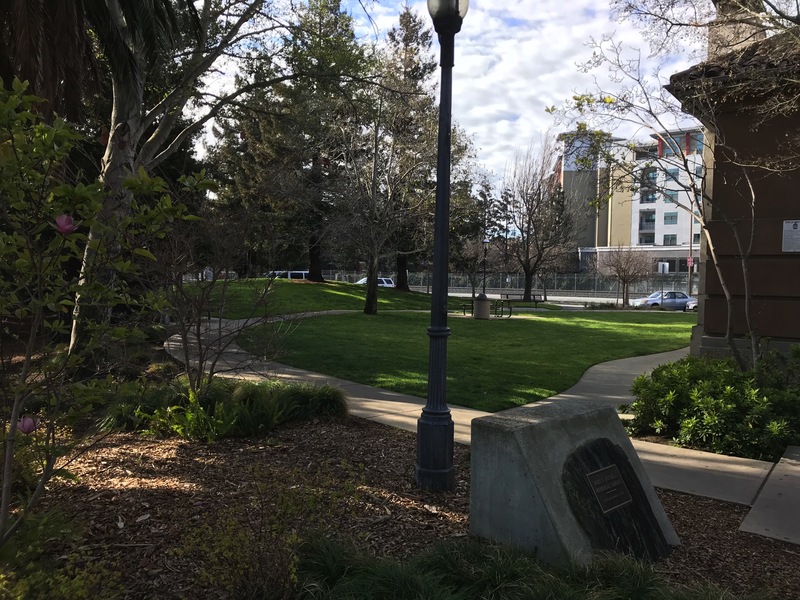 Nevertheless, a park on the Winslow site would still serve as a highly visible welcoming gateway to our downtown area to tens of thousands of people passing by aboard Caltrain and other possible future trains. Ah, the Dumbarton study: *that* must be where I read about possibly moving the station. Thanks! And thanks for the info on Quiet Rail Zones; I’ll have to read up on that. I too like Winslow as a kind-of “gateway” park that would make up for the loss of Depot Circle. However, I *think* I’ve heard some talk that when Caltrain is electrified, our Caltrain station might be moved–as I recall, just north of Broadway (I need to do some more digging to try and figure out where I heard that). If that is the case, a gateway park on the Winslow lot would make no sense. And of course the Winslow site wasn’t one of the ones that was moved to Phase II; it really doesn’t seem to have a shot. Incidentally, the Winslow site would be even better if we could just tear down the old Pizza and Pipes building and gain that additional square footage. The City Council briefly raised the idea of doing a land swap; maybe they could swap for the land upon which that building sits. Personally I would like to see the Main Street parking lot space returned to its natural state as Redwood Creek. There is plenty of room to build a park along the creek. Then tear down the Marshall garage, move the fire station on Marshall somewhere else and extend the currently buried creek into a waterfront trail to the bay. If we were to return Redwood Creek to its natural state it would become a must see tourist attraction and wellspring of local pride. If our founding Fathers were not so greedy and had half a brain they could have dredged and maintained the creek as a bustling downtown waterfront where deep sea marine vessels could still navigate. Will we ever learn from our greedy mistakes? In a perfect world I would completely agree with you. But realistically there is no way the fire station or the parking garage are going to be moved. However, there was some discussion at the City Council meeting about creating a master plan that covers a continuous strip from the main library all the way to the Bay, and working to at least make that entire route walkable (along with a park or two along the way). If the city does build a park on the Main Street parking lot, I for one will be pushing to at least design it to pay homage (if not more) to the creek and to our historic waterfront. Thank you Greg, for the detailed and thorough walking reports each week. I really enjoy reading them. The main concern I have about building parks in the areas mentioned is the potential for an increase of homeless people camping out. Indeed that is an issue, but not one, in my opinion, that should prevent us from building a park. Instead, we should tackle the homeless issue head on, which exists whether or not we build a park. It is definitely something that should be taken into account, though. Thanks for bringing it up. I’d like to make a comment regarding the parking lot you use as a short-cut and your desire to turn it into a park. I don’t think you’re taking into consideration that people actually live in apartment buildings on Main Street and we need this parking. The apartment owners do not supply enough spaces for even one spot per occupant (and of course many families have more than one car) so there are waiting lists, meaning that when many people get home from a long day at work, they already have to pray to find a spot. Then you have to lug groceries, etc. to your home or luggage if you’re traveling. If the weather is bad, that’s even more fun. You get home from work on Friday evening, or back from running errands on Saturday, and good luck trying to find a spot. One Friday afternoon before I made it through the 8 month wait list, I spent 50 minutes before finding an open spot. One of the buildings is for seniors and you want to make them travel even farther to get to their vehicles? Please realize that downtown isn’t just a place for you to visit, it’s also home to many. Would a park be nice? Possibly, if police were willing to keep if free of drunks and other undesirables, but not at the expense of residents who live here. That is an excellent point – thanks for sharing! You are absolutely right, I was not taking that into account. I’ll have to give that one some thought. +terrysagirl, Absolutely agree! And until there’s convenient parking, I will continue to take my business to San Carlos, Menlo Park, Palo Alto. In fact, the parking and congestion has gotten so bad at Sequoia just to go to Safeway, that I now go to the MP Safeway. Maybe a few minutes farther, but without the headaches.